What was Oribe thinking when he said, “Anyone can wear this style”? Then he added that “your hairstylist should help you modify it to work with your features and lifestyle.” In our opinion not anyone can wear the look. For women who have curly or even very wavy hair, it would be difficult, time-consuming, expensive and simply unrealistic for those of us who aren’t rich & famous! If you still want to copy the bob, go to the best hairstylist you can find (or afford!) and ask for the precise cut. It takes a lot of talent to get everything just right, starting with the very blunt ends that angle from short in back to longer in front. The bangs should be cut to flatter your face shape, and the hair at nape has to be buzzed or snipped to hug the head. At home, blow-dry your hair as straight as possible and apply a heat styling product. Use a flat iron on small sections of hair at a time. Spritz hairspray on a comb and smooth any frizzies or strays. 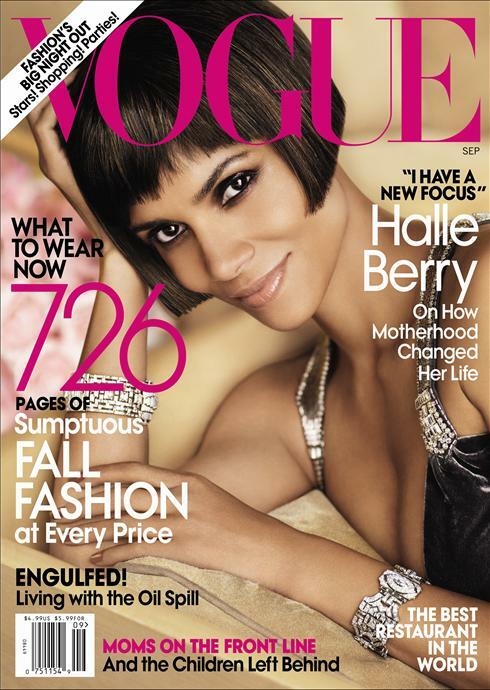 Can you imagine Halle’s former hairstyles with the Vogue fashions inspired by the 1920s? We can’t. She was well known for her pixi e short cut, and her longer locks garnered plenty of attention, too, but they would break the Art Deco mood. Personally we don’t think this look fits her personality, and it will be interesting to see how long it lasts. Vogue photos by Mario Testino. Long hair photo from TODAY LIFE. Short hair from Splash Photos. This entry was posted in Celebs, Movies, star makeovers and tagged Celebrity hairstylist Oribe, Halle Berry, Retro hairstyle, short bob hairstyle, straight hair, Vogue magazine. Bookmark the permalink.